I’m looking to secure the front and back doors of my house with a hi-res PTZ camera. I would rather utilize the soffit/overhang outside than having to run lines thorugh an exterior wall. I was looking at this Hikvision DS-2DE3304W-DE (https://www.amazon.com/Hikvision-DS-2DE3304W-Outdoor-Network-Compression/dp/B01FCU849G/ref=sr_1_32?ie=UTF8&qid=1480734498&sr=8-32&keywords=outdoor+ptz#Ask). But I don’t see that it is supported by Netcam. I did get a couple Wansview cameras to work with an alternative model of Wansview. As the cameras I bought were not an option in the configuration. But I don’t want to be out several $100’s if I can’t connect them to Netcam Studio. Any other cameras like the one above that you have gotten to work I would certainly be willing to take a look at. Network Camera: a pre-made template for a specific camera model where also PTZ work if the camera have that. ONVIF Source: many manufacturers comply with the ONVIF standard which makes it so much more easy to connect a camera to NCS (or any surveillance software). This gives video and audio. If 1 and 2 do not work we also have the Custom URL. Here you must know the exact URL for that camera. Sometimes that is very easy to find and sometimes more difficult, but Internet is a very good source. Using alternative 3 gives video and audio with the correct format, but no other feature like PTZ. In your case I only see alternative 3 since the cam is not onvif compliant. It can work with a template for some other Hikvision camera, but no guarantees. 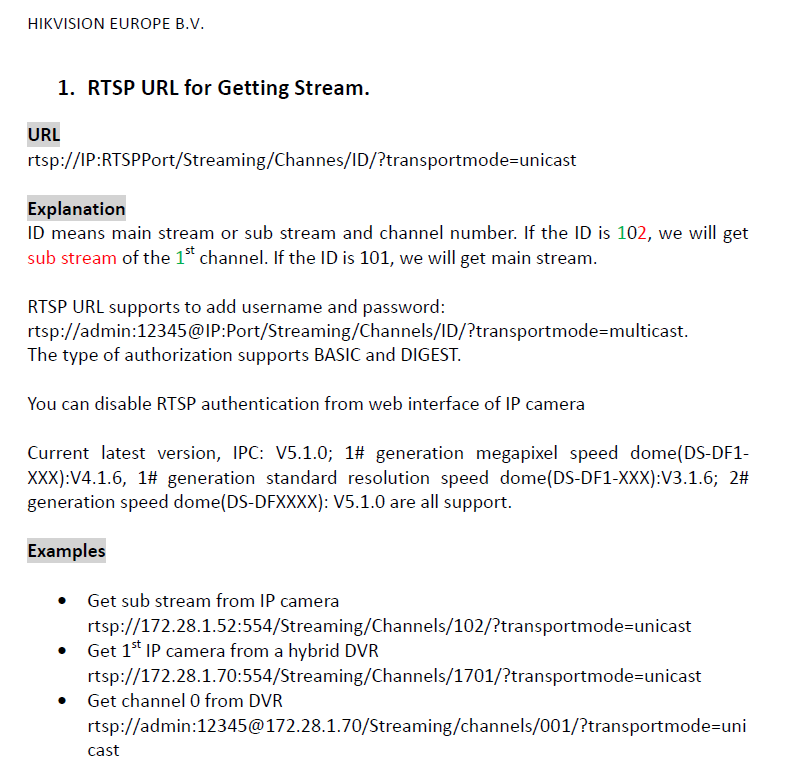 Set Stream Type to rtsp_tcp. Also, keep in mind that using all the 3 Megapixels of the cameras use a lot of computer power. Quite often a lower resolution is very adequate. Alternative is to find an IP camera that support onvif. Good luck and you know where to find me ;). Thanks for the reply! So you are saying that if a ptz camera is onvif compliant, I will most likely have ptz functionality in ncs? According to this PDF, it is onvif compliant. Sorry, this is for an alternative camera I was also looking at. Unfortunately, I have say no on this. 2. ONVIF Source: many manufacturers comply with the ONVIF standard which makes it so much more easy to connect a camera to NCS (or any surveillance software). This gives video and audio. Today, in NCS an onvif compliant IP camera only give the URL for the video and audio stream. No PTZ. The basic problems is that PTZ cameras use different protocols and ports for communicating the video/audio stream and controlling the ptz. These cannot be combined in the same URL. That Trendnet cam also seems to be a good one from the specs.